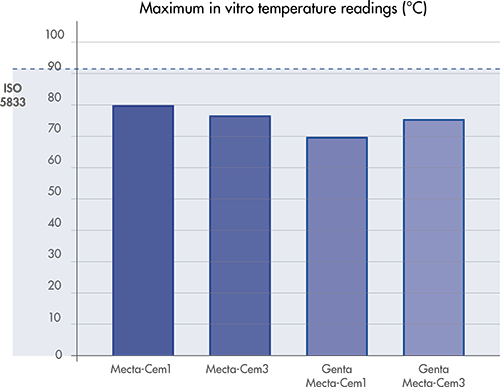 The current composition of the different versions of Mecta-Cem have taken into account the long acquired experience of other major cements available. 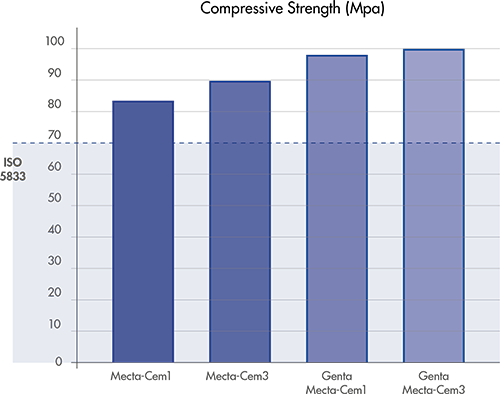 In order to achieve a higher quality product the major current cements were carefully analysed and tested to determine both the strong and weak points of each, the strong points being included in the development of the different Mecta-Cem while eradicating the less favourable aspects. Mecta-Cem powder/liquid ratio has been greatly improved on, therefore only 30 seconds are required for the initial mixing phase in order to obtain a homogeneous dough free of any entrapped air bubbles. Mecta-Cem can either be mixed by pouring the total liquid as when using vacuum mixing devices. High precision dosage of each component during manufacturing ensures that each box of Mecta-Cem will react in exactly the same manner thereby avoiding the regular drawback with existing cements of not having exactly the same reaction time from one dose to another. The very low viscosity of our Mecta-Cem 3 and Genta Mecta-Cem 3 make syringe filling much easier. Mecta-Cem also stick less to surgical gloves. 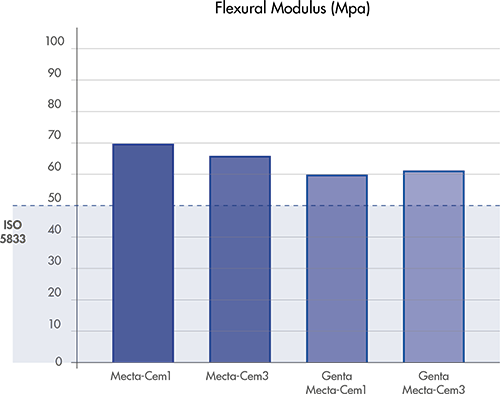 The high degree of purity of Mecta-Cem components and the micro precision dosage reduce standard setting time by one minute. This directly reduces the time surgeons spend waiting. Mecta-Cem is available both with and without antibiotics. 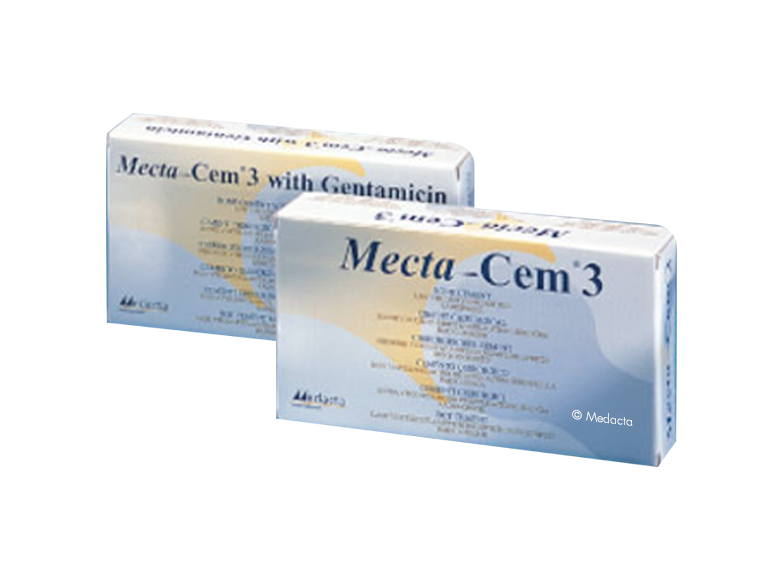 Genta Mecta-Cem is pre-blended with 0.8g (1.2%) of Gentamicin sulphate, which has a broad antibacterial spectrum and long lasting antibacterial protection. Chang Y, Tai CL, Hsieh PH, Ueng SWN, Gentamicin in bone cement – A potentially more effective prophylactic measure of infection in joint arthroplasty. Bone & Joint Research 2013; 2:220-6. Mecta-Cem exists both in standard and low viscosity versions. Standard viscosity cement (Mecta-Cem 1 and Genta Mecta-Cem 1) is recommended for manual application, whilst low viscosity (Mecta-Cem 3 and Genta Mecta-Cem 3) is preferred for syringe delivery. Polymerisation temperatures shown in this document are temperatures measured in vitro in compliance to the bone cement guide lines. True temperature is generally lower due to thermal inertia of the prosthesis. 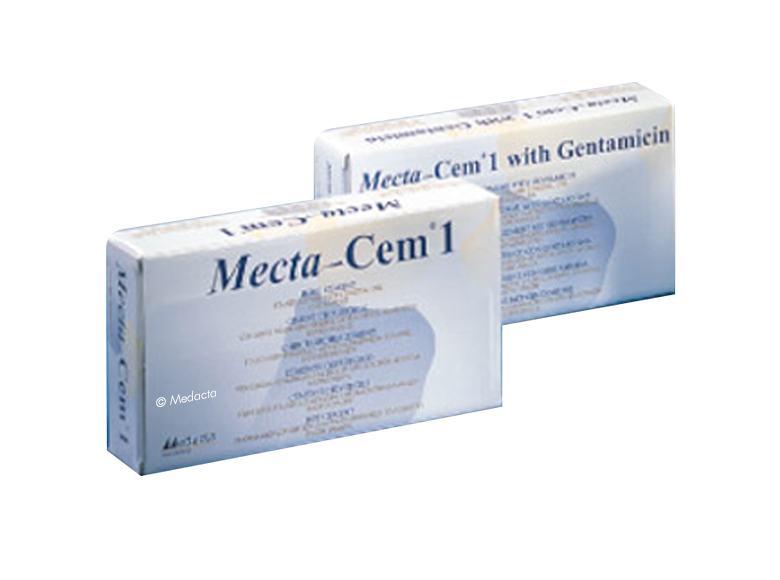 Genta Mecta-Cem contains 0.8g (1.2%) of Gentamicin sulphate. Adding of antibiotics does not modify the properties of the cement in a significant manner. 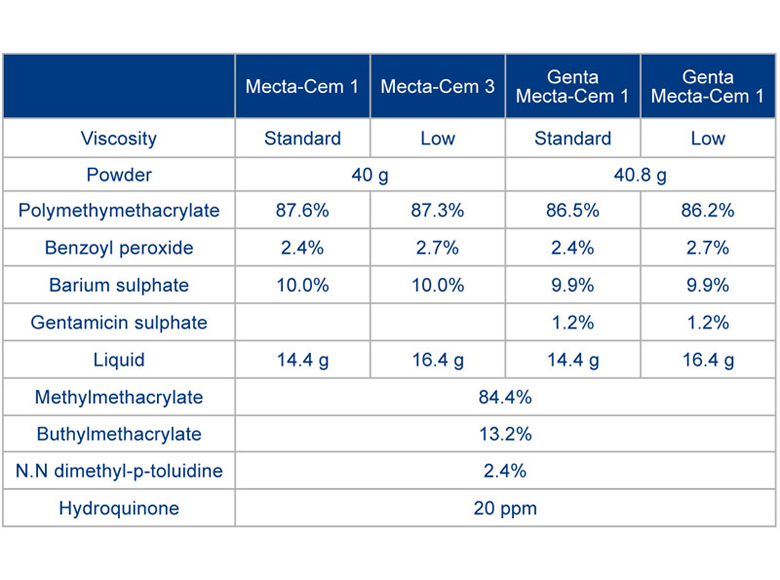 The composition of Mecta-Cem is very close to existing well know cements. The choices adopted are all to be found in one of the two leading products available and only differing by the additives. If buthylmethacrylate is to be found in Mecta-Cem this is because it's monomer is an ester with a longer molecular chain which significantly reduces polymerisation temperatures (see temp chart), while generating less vapours. From a clinical point of view this is very important as less temperature causes less bone necrosis and means less monomer in the vascular system during surgery. From a technical point of view it also improves the elasticity properties of the cements since it modifies the molecular structure enhancing long term results. The choice of barium sulphate is also linked to a rationale choice since literature and various studies have brought to evidence that barium sulphate causes less damage to bearing surfaces and lower wear rates while reducing particulate debris. 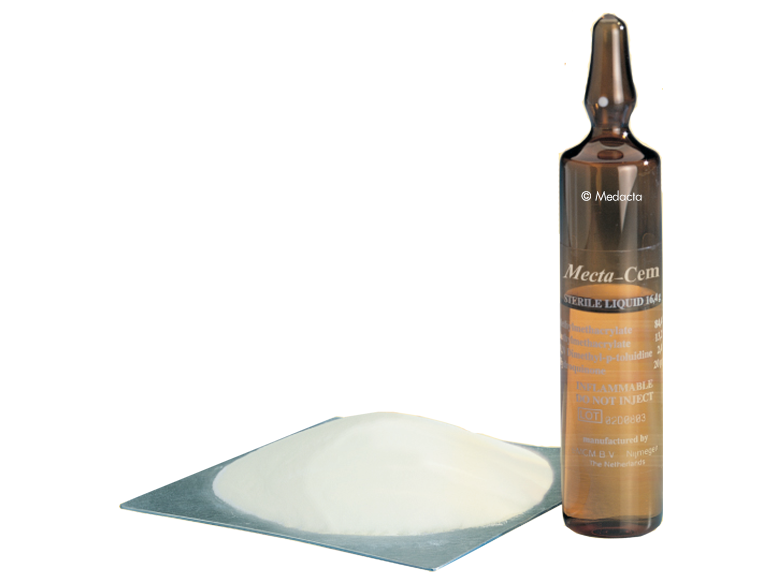 Mecta-Cem bone cements are therefore three times less abrasive than cements containing zirconium dioxide.